3 Bedroom Detached House For Sale in Leicester for Offers Over £210,000. 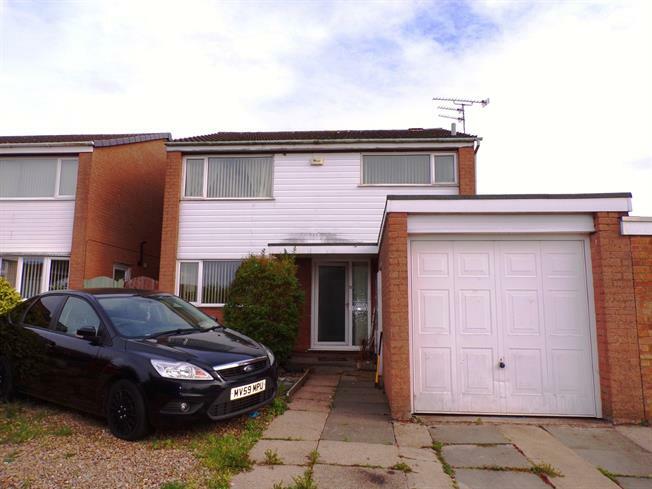 Spencers are delighted to present to market this three bedroom detached family home in need of some modernisation. Situated in the popular village of Fleckney, the accommodation comprises of, entrance hall, wc, kitchen, living room, to the first floor there are three bedrooms and a family bathroom, to the front is a single garage and off road parking, to the rear is a good size garden with patio area. UPVC double glazed door. Double glazed uPVC window facing the front. Laminate flooring. Roll top work surface, wall and base units, stainless steel sink. UPVC sliding double glazed door, opening onto the patio. Radiator. Storage cupboard. Double glazed uPVC window facing the front. Radiator, built-in wardrobe. Double glazed uPVC window facing the rear overlooking the garden. Radiator, a built-in wardrobe. Double glazed uPVC window with obscure glass facing the front. Heated towel rail, tiled flooring. Low level WC, corner bath, single enclosure shower, wash hand basin. To the front of the property is a paved driveway leading to a single garage with up and over door, the rear garden is private and enclosed, with full width patio area, generous lawn with pond, garden shed, borders filled with plants and shrubs, side gated access to the front.